Writing powerful posts has much more to do with you than it does with anything I share here. There are no formulas you can follow to make you a powerful writer. A decent writer, sure. An engaging one, maybe. But a writer who makes people feel something, a writer who puts a smile on her reader’s face, a writer whose posts stay with the reader long after they are read…well, you’re already that writer. All I can do is help you unleash your creativity and writer’s voice. So. 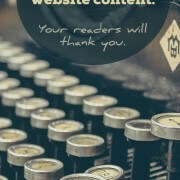 With that said, here’s how you can write truly memorable blog posts. 1. Write from a place of depth and honesty. Writing that comes from a deep, honest place is just different from writing that doesn’t. So when you sit down to blog, make sure that you feel what you’re writing. That it comes from the center of yourself. Or that it comes from a genuine love of your readers and wanting them to learn something essential. Even as I’m writing this, I’m thinking, Daniela, are you really asking them to do this? Don’t you think it’s a bit much? There are millions of blogs out there. Millions. And the ones you remember are the ones that move you, or teach you something that makes you excited to take action. So when you write, give yourself a minute to clear out the clutter from your brain. And then let your creative, writer’s mind take over. Write what needs to be written. And only that. When you write in this way, you will learn from your own writing, too. You will learn what you want to teach and how you want to inspire your readers. And remember, that honest writing doesn’t need to take a lot of preparation or fanfare. It’s just about trusting yourself to write what needs to be written. That’s it. 2. Zoom in and show us the details. When you think about the moments that changed your life, you can remember them vividly. One of my most treasured moments was the first time I traveled to a third world country. My friend Erin and I were sitting on the back of a boat in Lake Petén in Guatemala. My feet were in the water, the air rushed around me, and I looked out over the green expanse of the lake. Erin grinned widely, and said, “Dude, we’re in Guatemala.” It felt like the world was wide open to us, like nothing was impossible. I’ll never forget that feeling. Reading that description, you can see the moment, can’t you? You can imagine my feet in the green water, you can feel the wind. If I had just written, “One of the best times in my life was when I went to Guatemala,” I would be robbing you of the actual experience. So when you write, give your readers the details. Don’t just tell them what happened, show them how it happened. Even if you’re writing a tutorial, get specific. Take screenshots. Share your own experience with whatever you’re teaching. You may think that no one wants to know about your dog lying at your feet while you made your latest creation, or that she started licking your toes midway through, but they do. Believe me. 3. Write to connect, not to sell. Many of us online are here because we want to inspire others, but also, because we want to make money. But people can tell when your only purpose for writing is to sell. Instead of focusing on selling, put your energy into making that connection with your reader. Show her that you know her better than she knows herself. Many marketers will tell you, Don’t focus on the features of your product or service, focus on the benefits. People want to know what’s in it for them. True. And they also want to know why they should buy from you. People don’t long to be sold to. They long for connection. They long to be seen and understood. Yes, they want solutions to their problems. But they also want to get those solutions from people they truly trust. So shift your thinking about your offerings. Forget about cajoling people into buying from you. Instead, work on creating content that connects. Let them come to you because they are so excited about what you have to offer. Stories are memorable. Stories teach us about each other and about life. And they don’t need to be long. In fact, think about that tiny story I wrote above, the one where I was in Lake Petén. It’s a few sentences long, but in just those few sentences, a whole story unfolds. My first time traveling. The feeling of being young and free. My bare feet in the water show you what kind of 20 year old I was. And it’s enough. You don’t need any more than that. Remember that when you write. You can write stories that span a few minutes of your life. You can also write epics, if you want. But tell stories. Share moments of your life where a change happened. Tell us about your personal transformations, your mistakes, your low points, your moments of sudden insight. Bring us into your world. You may think your world is too mundane, too boring, too insignificant to share. I promise you it’s not. I’ve noticed that the voice of whatever book I’m reading also bleeds into my thoughts and my own writing. Unfortunately, it happens whether I’m reading crappy romance novels or fantastically written epic fantasy novels. If you want to develop a powerful voice, you must read books that are written masterfully. Devour great writing and try to stay away from reading crap. 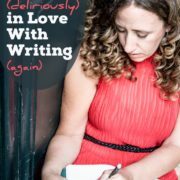 My high school writing teacher used to say that poorly written novels, while they may be easy to read, should be treated like dessert – read sparingly and only after a hearty meal of delicious, well written prose. 6. Make us feel something. If you can make your readers feel something, they won’t forget you. Make them feel inspired or joyful. Evoke empowerment or surprise. Even make them shed tears of despair, if that’s your thing. But make them connect with your writing emotionally. Whenever you write a post, ask yourself, How do I want my readers to feel while they are reading this? Imagine them reading your writing, and smiling, or sighing with contentment, or laughing hysterically. Then shape your words around those emotions. A good rule of thumb – if you feel a certain way while writing, your readers will most likely feel that way while reading your post, as well. I freaking love it. Because letting go is the best way to write something truly inspired. When you write, let go of trying to impress your audience. Let go of needing your words to come out in a certain way. Let go of wanting to be liked, or internet famous. Let go of your thoughts and worries about how shareable this particular post is. Instead, just let the words flow through you. Trust your inner voice to create something incredible. Oh beautiful reader, you are already an amazing writer. You are already a storyteller, a feeling-creator, a memory crafter. All you need to do is sit down and get writing. Your voice and your intuition will do the rest.